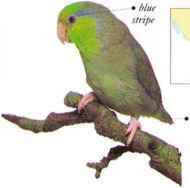 in the wild this familiar small parrot lives in nomadic flocks that search for seeding grasses and other vegetation in their arid habitat. Flight is strong and rapid. Flocks rarely stay long in one place, but the birds settle and breed in holes available during the brief period of plant growth that follows rain. • NliST An unlined hole or hollow in a tree trunk, a rotten stump, or a fencepost. DlSTRlBt tion _ is always green and yellow. 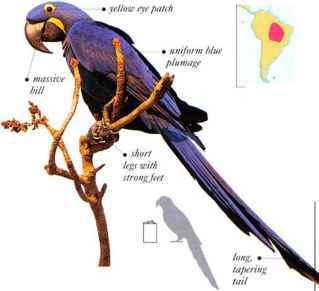 This tiny parrot of open woodland occurs in small, fast-flying flocks. It uses its brush-tipped tongue to gather nectar and also eats flowers, fruit, and seeds, sometimes (though rarely) hanging upside-down. 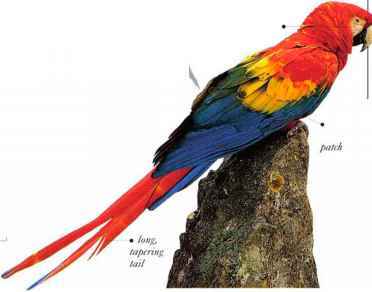 Hanging parrots, like some lovebird species, carry nesting material tucked into their rump feathers. 0* NEST Tree hole female lined with leaves. • DISTRIBUTION Malay ______________________________Peninsula, Sumatra, Borneo. Not easily seen among the foliage, this tiny, green-faced parrot inhabits secondary forest (regrown after felling) and scrub. Here it feeds mainly on small seeds taken from grasses and other low plants, and on berries from bushes. It usually occurs in flocks or family parties, uttering noisy, chattering calls. Its flight is fast and crratic. • NliST An unlined hole in a branch, tree trunk, or post. 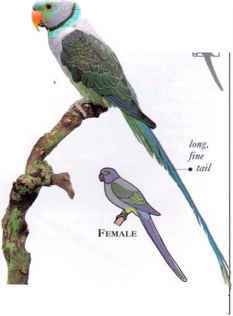 1 he glowing head plumage of the male Plum-headed Parakeet is unmistakable. This is an active species and usually occurs in small flocks that move swiftly over the trcetops with rapid wingbeats, calling with shrill, screeching notes. It lives in the lower warmer zones of hill woodland, and in lowland forest, particularly where the trees border cultivated areas. Though normally wary of feeding at ground level, it often feeds on cultivated grain and rice. It also cats other seeds, berries, and other fruits, particularly figs, and takes nectar from blossoming trees. 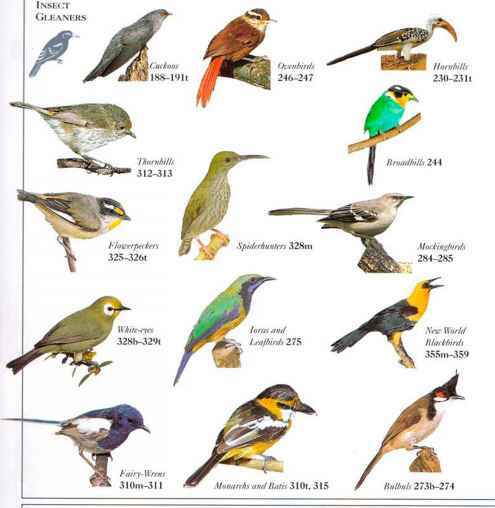 When not breeding, it gathers in large communal roosts at night, but breeding pairs usually remain at the nest hole, guarding it closely against possible takeover by other birds, such as mynas. Its calls, though shrill, are fairly short and musical. • NliST A cavity in a hollow branch, or an old woodpecker hole. • DISTRIBUTION Much of the Indian subcontinent. The subtle combination of hues in the plumage of this long-tailed parakeet provide camouflage among leaves and branches. It lives mainly in evergreen and broadleaved hill woodland, but on the borders of its range it is sometimes seen in the drier woodland of lower altitudes in the company of Plum-headed Parakeets. 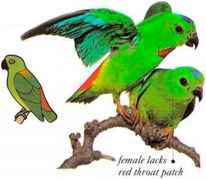 The Malabar Parakeet usually travels in family parties or small flocks. Its flight is rapid and level, with fast wingbeats. The species gets most of its food from forest trees, taking buds, nectar and pollen from tree blossoms, nuts, and fruits such as figs and berries. 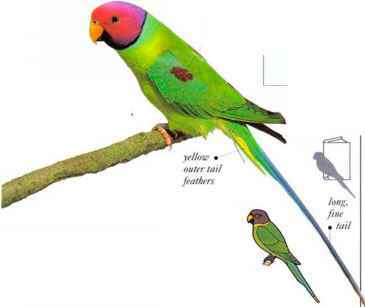 Where the forest borders on to farmland, Malabar Parakeets often take the opportunity to feed on crops such as grain, vetches, and orchard fruits. This is a noisy species with a shrill, harsh, two-syllable call. • NliST An unlined hole-in the trunk or branch of a tall tree, situated high above the ground. — •Distribution distribution S.W. India.